The candidates who are contesting in this upcoming polls are-- Bahujan Samaj Party’s Ayatu Ram Mandavi, Deepak Baij of the Congress, Baiduram Kashyap of the Bharatiya Janata Party (BJP), Ramu Ram Maurya of the Communist Party of India (CPI), Panish Prasad Nag of the Ambedkarite Party of India, Manglaram Karma of the Akhil Bharat Samagra Kranti Party and Suresh alias Sargim Kawasi of the Shiv Sena. Lok Sabha Elections 2019: The general elections kick-started on April 11 to constitute a new government for the next five years. Chhattisgarh will vote in in three phases with the Naxal threat looming large over the state. The Naxals have challenged the Election Commission of India (ECI) over ensuring free and fair polling across the state in the 1,880 polling centres. The candidates who are contesting in this upcoming polls are– Bahujan Samaj Party’s Ayatu Ram Mandavi, Deepak Baij of the Congress, Baiduram Kashyap of the Bharatiya Janata Party (BJP), Ramu Ram Maurya of the Communist Party of India (CPI), Panish Prasad Nag of the Ambedkarite Party of India, Manglaram Karma of the Akhil Bharat Samagra Kranti Party and Suresh alias Sargim Kawasi of the Shiv Sena. Chhattisgarh has a total of 1,89,16,285 voters, comprising 94,77,113 men, 94,38,463 women and 709 third-gender persons. Meanwhile, the number of voters between 18-19 years of age are 4,60,394. Tribal leader Khelsai Singh, an MLA from Premnagar Assembly seat, has been nominated from Surguja Lok Sabha constituency. Singh had earlier represented the Surguja Lok Sabha seat at least thrice– in 1991, 1996 and 1999. Apart from Singh, Dipak Baij will contest from the Bastar Lok Sabha constituency. In Raigarh, the BJP has fielded Gomtee Sai against Congress’ Laljeet Singh Rathiya, who is the sitting MLA from Dharamjaigarh Assembly seat. There are a total of 2,48,329 voters in the seat, which includes 1,25,308 male voters, and 1,22,987 female voters. In the 2014 Lok Sabha elections, BJP led in the Raigarh Assembly segment of the Raigarh (ST) Parliamentary/Lok Sabha constituency. Incumbent MP Kamla Devi Patle of BJP will contest from Janjgir-Champa Lok Sabha seat. The other BJP candidate who will contest from the same seat is Gujaram Ajgale and he will face Ravi Bhardwaj of the Congress. There are a total of 2,03,123 voters in the seat, which includes 1,04,198 male voters, and 98,913 female voters. There are a total of 2,26,306 voters in the seat. 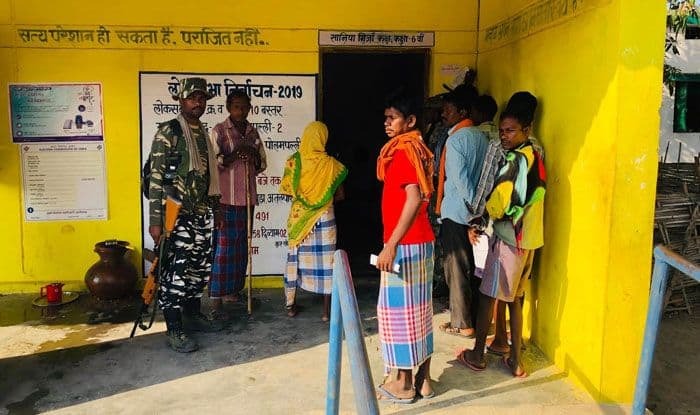 In the 2018 Chhattisgarh by-elections, Korba recorded a voter turnout of 71.56 per cent. In 2013 the turnout was 69.89 per cent, and in 2008 it was 63.65 per cent. There are a total of 2,17,898 voters in the seat, which includes 1,09,373 male voters, and 1,08,506 female voters. In the 2014 Lok Sabha elections, BJP led in the Bilaspur Assembly segment of the Bilaspur Parliamentary constituency. BJP won this seat in the 2008 Assembly elections with a margin of 9,376 votes thus registering 51.79 per cent of the total votes. There are a total of 2,01,841 voters in the seat. Congress led in the Durg City Assembly segment of the Durg Lok Sabha constituency in the 2014 Lok Sabha elections. Pramod Dubey will contest from Raipur seat which will go to polls in the third phase of the Lok Sabha polls, that is, on April 23.